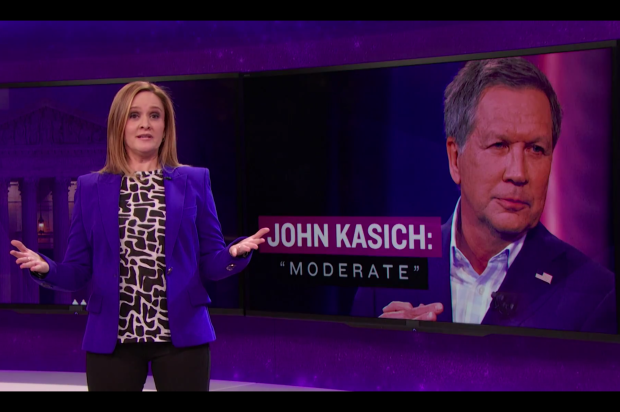 John Kasich has tried to establish himself as the most moderate of the Republican candidates, but Full Frontal host Samantha Bee ain't having any of it. "In the nauseating bus terminal restroom that is the Republican primary, John Kasich initially seems like the least disgusting stall," she starts off, before diving into some of the presidential hopeful's lesser-publicized stances on gay marriage and reproductive rights. Turns out he's not so moderate after all. Watch the entire segment below. Enjoy!